This seashells is perfect for your real or dream beach house. 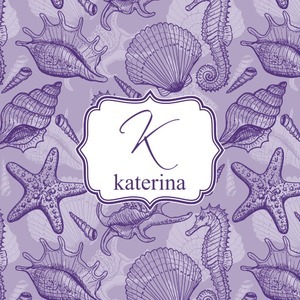 It features a conch shell (so you can always hear the ocean), clam shell, sea horse, and starfish, all on a sweet purple background. You won't even have to be at your beach house to feel the sand between your toes. Add your monogram in the fun, octagonal label for that last special touch.